First of all, before I go into what I did over the weekend, you need to understand something. I have a very warped sense of fun, very warped. I enjoy setting these peculiar challenges for myself. The fun part is in how creative I can be in fulfilling the challenge. 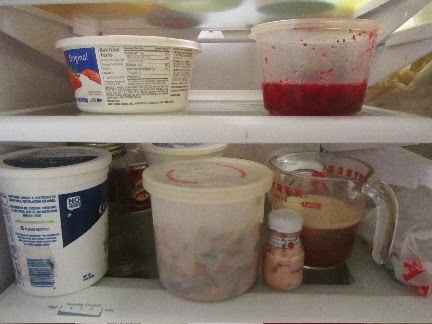 So, Saturday morning, I opened the refrigerator door to see this -- a leftover bonanza! Yeah, it is kind of hard to find anything in there, isn't it?! How would anyone know what was edible and what wasn't, with all the opaque containers and plastic bags over everything. 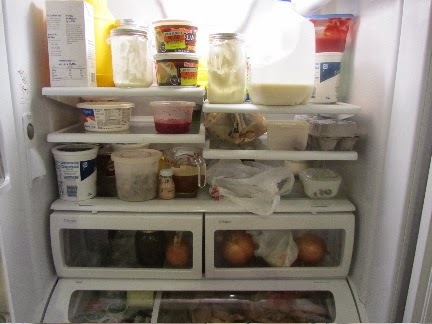 My challenge, then, was to use all of the odds and ends over the weekend, without creating new leftovers. I didn't have a master plan, but just took each meal as it came, and tried to use as much of this stuff as I could. These wouldn't be just any waffles (but you knew that already). 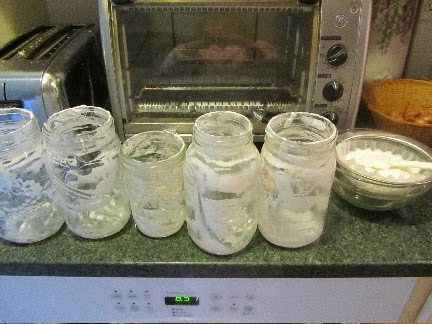 From the fridge, I pulled out all the almost-empty jars of yogurt, 5 in total. Empty, with the exception of the weird yogurt liquids which accumulate at the bottom of the jar. Anyway, I was able to salvage a little over a cup of yogurt, enough to flavor with vanilla and sugar to top the waffles. The strainer, by the way, was to separate the unappetizing liquids from the more palatable yogurt. I saved this liquidy stuff to use in the waffle batter. 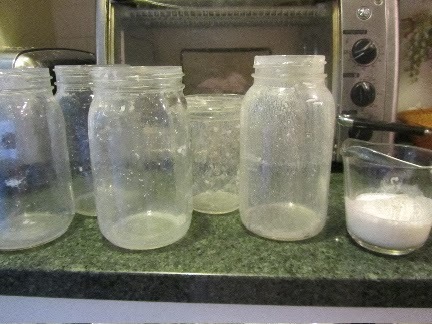 After scraping the jars, I then rinsed all of them with a bit of water. I poured these rinsings into a measuring cup. I had about 1/3 cup of rinsings, to add to the yogurt whey. This made up about half of the liquids I would need for the waffle batter. The jars after scraping and rinsing them out. The "stuff" in the measuring cup is the rinsings. 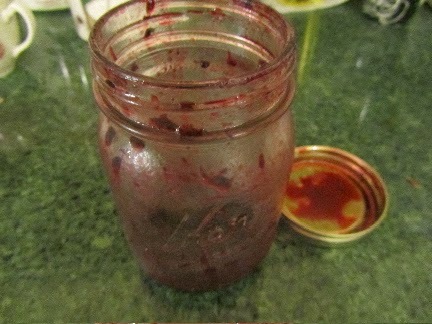 Along with the vanilla yogurt, we also had some runny (liquidy) blackberry jam, and a bowl of blackberries from the freezer. Okay, remember my rule, to not create new leftovers? What do you think happens when you thaw frozen fruit? You get more liquids. Adhering to my rule, I set the liquid aside, to use in making dinner. No new leftovers, so far. In the next installment: what I found that I could use in meals for the rest of Saturday. Riveting. I know. I lead an exciting life. A rubber spatula and leftovers -- a frugal cook's lethal combination! I love challenges like this so I might be a little weird, too. Can't wait to see what you created for the rest of the weekend. So I'm not the only one with a warped sense of fun! LOL! That rubber spatula is so valuable. I've rescued so much food from so-called empty jars with that tool. I so agree about the spatula. I have similar skills. In fact, my cousin and I both get annoyed the few times we watch cooking shows because there is so much left behind in a mixing bowl. Carry on with the leftover journey. Very inspiring. Oh! I've never paid attention to that on cooking shows! Now I'll see that for sure! I am amazed at how many of my friends don't use rubber spatulas. 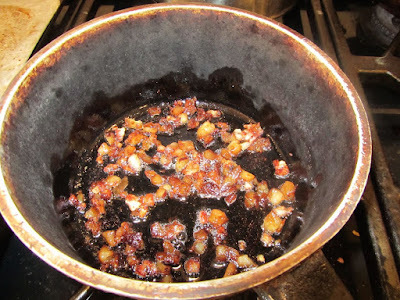 The one time I was brave enough to suggest it, a friend just shrugged and said she thought she pretty much cleaned the jar with a spoon anyway. In my head I was thinking, "not quite, girl friend! I could get another serving out of there!" I'm the same I'm afraid! Good work, let's see your fridge now! Oh good! Another person with a quirky sense of fun! We take our fun where we can find it, I guess! I took a couple of "after" shots that I'll post at the end. OK, Lili, I thought I was the queen of the rubber spatula! I showed my daughter how much waste is in a bottle of body lotion she declared to be empty. I cut the bottle in half and using my rubber spatula pull about another 3 weeks worth of body lotion. I use a rubber spatula for just about every bottle I can get my hands on--peanut butter, ketchup, mayo, etc. And there's nothing wrong with being frugal since we paid for these items we get to use every last bit of it. If we added up what others throw away, it would be a ton on money down the drain. Good for you for showing your daughter how much is still in the container! I did that a couple of summers ago with the sunscreen. One of my kids was sure we had to rush out to buy a new bottle. Instead I cut it open and was able to rescue several applications of sunscreen. Then last summer, one of my daughters followed suit and cut open the sunscreen bottle herself! The kids are listening and learning!! You're right, we did pay for every last drop in the container. 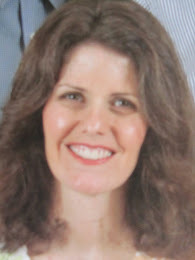 I'm sure you have said something similar to your family, but I've been heard to say (very often) "you wouldn't just throw a nickel in the trash would you? ", when someone hints that maybe I'm going too far. I wish someone would invent a super-skinny rubber spatula. Maybe they have and I just don't know about it yet. I wouldn't have thought to use the yogurt liquids. I like to use yogurt in my batter for pancakes/waffles/muffins, etc., as I think it makes them light and tender. Both the yogurt and the whey are mildly acidic, so they react with the baking soda portion of the baking powder, and do yield fluffier pancakes and such, much like if you used buttermilk or soured milk.I think they have more flavor, too. Wait... I'm envisioning the spoon-ula infomercial... brought to you by Lili-co. Order now and get the mini spatula free! That's a $50 value for only $19.99! But wait... order in the next 15 minutes and we'll double your order, just pay for the shipping and handling. That's 2 spoon-ulas, and 2 mini-spatulas - a $100 value - for only $19.99! I was just going to add, Cat, that SOMEONE has been watching late night TV!! I consider yogurt whey to be precious... 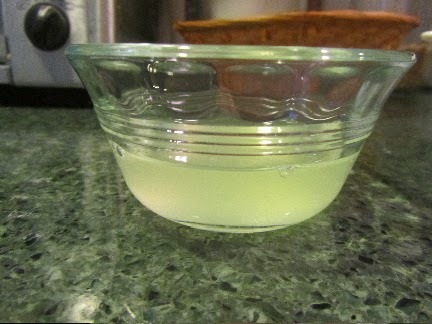 I use it when I make my own salad dressings (which are usually yogurt based). It adds flavor and helps keep them from getting too thick! some people use whey in soups, too. I just mostly use it in baking. Whey can also be frozen, if you find yourself with more than you can use within about 10 days. 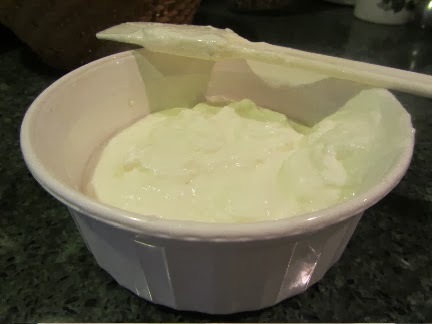 I've been making a lot of Greek yogurt lately, so I have quite a store of whey in my freezer. I was looking up the nutritional content of whey recently, and whey contains protein, calcium, magnesium, potassium, phosphorus, and the B vitamins in amounts enough to matter. It's a valuable food in its own right. I guess you can see from the comments that you're preaching to the crowd here. A spatula is a very valuable tool. So, what came next in your leftover day? An interesting sandwich which some in the family declared was more like dessert, some snacky stuff, and a salad so tasty I had to make a repeat for tonight. I need to do this this week - we had a housewarming party and our fridge is chock full of leftovers! I've been eating them for lunch, but I'm sure I missed stuff! a housewarming -- how fun! And I bet the leftovers were really tasty! That never occurred to me, the difference between silicone and rubber spatulas. Interesting.